Shameem C. Hameed is the founder and chairman of the ZH Group which includes ZH Healthcare and VectorShades. ZH Healthcare provides open source electronic medical records, SaaS, and revenue cycle management solutions to healthcare providers worldwide. With a team of over 100 information technology professionals ZH Healthcare now supports a significant population of healthcare providers in the US, India, Africa and elsewhere. VectorShades provides structural steel detailing services and rebar detailing services for the construction and engineering industry. With over 60 specialized engineers and detailers VectorShades has successfully completed and delivered industrial, commercial, institutional and infrastructure projects to fabricators all over the United States. He started his career as a lawyer enrolling in the Bar Council of Delhi and practicing in the High Court of Kerala and was an active member of the Cochin Stock Exchange, Ltd. and the Indian stock market for over ten years. 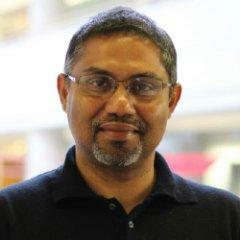 Hameed founded Datamate Software and Exports Pvt., Ltd. in 1991. Datamate soon became a primary player in the markets on which it focused. The company developed and sold ERP products designed for the financial, hospitality, and healthcare industries. Hameed has a law degree (LLB) and a Bachelor of Commerce degree from the Mahatma Gandhi University as well as a Diploma in Industrial Relations and Personnel Management.